Months of research and development has culminated into all your services and features in an easy to use guest interface. Your guests can order room service, request a wake up call, check their bill, call a taxi and much more... While out enjoying what the local area has to offer, your guests, at the click of a button, is able to ask for any number of housekeeping services to be completed before they return. 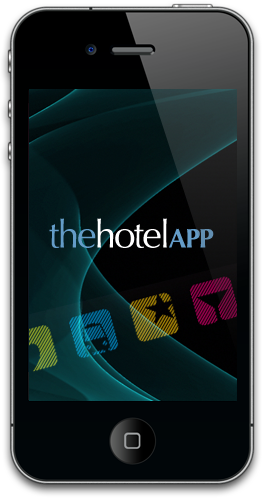 All this offers your guest the ability to interact with your hotel like never before. Our team can run through the various options of how your app will look and feel and together we can decide on what bests reflects your brand. The emphasis here is on flexibility and having synergy between your brand and your mobile app. We can easily turn off and on the many features that we offer and we can design you a totally bespoke design. We have developed an easy to use Content Management System [CMS] that will allow you to update your latest information from seasonal food menus to your latest news stories. The convenient ‘about town’ offering, can inform your guest what to do during their stay, from places of interest to local pubs and entertainment hotspots. If you like we can build a section called about town’ which can inform your guest what to do during their stay from places of interest to local pubs and restaurants. If your guests tend to venture into the local area to explore why not give them a helping hand and show the best places to visit, were does the best pint and where are the local places of interest? About town can educate your guests exactly what is on offer locally and it can even save them money when visiting local businesses in the area. Your guest will be able to view the menus of the top restaurants in your area from the comfort of their room. Help them save time and enjoy every moment of their stay in your area by pointing them in the right direction. The simplest way to book a room direct with your hotel. This feature can be easily integrated with your bookings page or your front desk. By consistently being positioned on the home screen of your guests phone you are constantly promoting your brand in an unobtrusive way. Many of your guest will prefer to make bookings on the move and the ability to check room availability and book in just a few taps will be a feature enjoyed by the guest who is on the move. 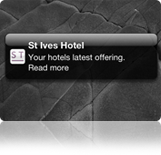 Send all your latest news and information in real time to your guest with our easy to use intuitive CMS. Engage your guest by sending your guest quality content from time to time through our push notification feature. What better way to let them know about your special weekend offers, send messages directly to the home screen of their phones. How many people do you think really read each and every email they receive? 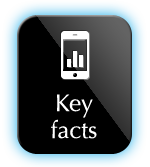 Our goal is to bring our customers the latest in mobile technology in the most easy to use way. You control all of your content with our easy to use CMS. Absolutely no technical knowledge needed. Type, confirm, update! We do offer full training and a training manual to all our customers but we promise you really won’t need it!